A group of winged putti holds a large burnished ormolu oval possibly formerly painted with a portrait or monogram. The frieze is flanked by ormoulu bas-relief plaques portraying allegorical female figures: one symbolizes L’Abondance (“Abundance”); she holds a cornucopia in one hand and agricultural products such as wheat and grapes aloft in the other. The second symbolizes La Paix (“Peace”); she holds an olive branch in one hand and with the other sets afire the instruments of war with a torch. The arched upper portion of the clock is supported by eight fluted columns with Doric capitals. The superbly painted clock dial under the rosette-decorated arch is signed “Coteau”. Joseph Coteau (1740-1812), acknowledged as the greatest enamellist of the eighteenth century, painted the unusually large dial with the signs of the Zodiac, typical of his dials with a day of the year indicator, but here with the very unusual motifs of a blue ribbon interlaced with a garland of roses that entwine the Zodiac reserves. The cordon bleu (“blue ribbon”) was understood in the eighteenth century to be the support for the royal order of the Saint-Esprit and therefore carried royal connotations. Members of the very restricted Order were known as “cordons bleus”. For example,from a letter by Horace Walpole written to Montagu while visiting Versailles in 1769 we read: "When the doors are open everybody rushes in, Princes of the blood, cordons bleus, abbés, housemaids and the lord knows who and what." The superb unsigned movement, quarter chiming with two bells, tells the time of the day and has a seconds hand as well as an annual calendar. The adjustable compensated pendulum, with deadbeat escapement, is centered with an Apollo sun mask and rests on a knife edge. Unusually, the hinge for the dial’s glass is at the top and the winding holes are cut low on the dial, indicating that the clock was designed to be positioned in a high place, somewhat difficult to reach. In addition, the underside of the upper portion of the clock has inset burnished ormoulu plaques and the clock face is decorated on its lower half with an exquisite ormoulu swag composed of flowers and fruits, all meant to be admired from below. Flanking the movement are figures in full relief depicting Justice and Minerva. Justice balances a sword, the emblem of her power, with one hand and with the other holds a scale, the emblem of her impartiality. The helmeted Minerva, (the benevolent goddess of wisdom and just wars, as well as a patron of the arts and learning) holds a spear with her right hand and carries on her right forearm a shield with a portrait of Medusa on its front. 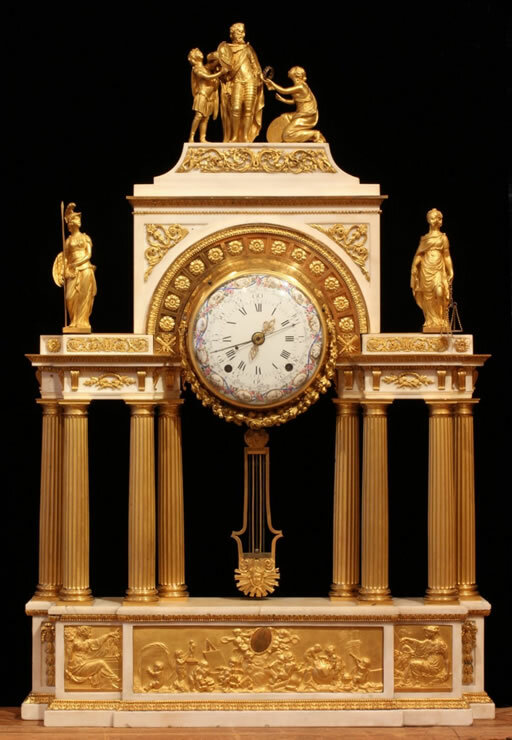 She holds a laurel crown in her left hand and gazes upwards toward the figures on the crest of the clock where a sculptural group depicts France, personified by classically dressed youths, paying respect to Henri IV, the founder of the Bourbon Dynasty, and the new “father” of the French nation. A young woman kneels against a shield bearing the royal emblem, three fleurs-de-lys, and offers her new king the crown. A young man, standing in Roman armor, offers a portrait of Sully, the main advisor to Henri IV, and considered by the ancient régime to be the paragon of ministers. Bareheaded, Henri IV wears a cloak over a full suit of armor; his sheathed sword has the same hilt as that of Justice. He embraces the portrait of Sully and gazes down at the young woman as he reaches for the proffered crown. They rest on an incurvated platform decorated with a superb reticulated ormolu relief composed of scrolls and rose vines, perhaps another reference to Marie-Antoinette, and two fleur-de- lys-headed scepters, which symbolize the royal power of the king. Another plaque with the unusual rose vine motif is on an exceptional table in the Frick Collection by Riesener, Marie-Antoinette’s favorite cabinetmaker. Another table by Riesener, the famous mechanical table delivered to Marie-Antoinette in 1778 and now in The Metropolitan Museum, also has roses integrated into a reticulated relief. The relief is found behind the handle that operates the top. One of the greatest bronziers of the eighteenth century executed the brilliantly chased two-color ormoulu of this masterful clock, with its superb original matte gilding and exquisitely burnished details. It must be a unique work, probably specially commissioned for a major room in one of the royal palaces. 1 belle pendule de cheminée en marbre blanc représentant un portique d'architecture orné dans la frise du bas de 3 bas- reliefs, l'un caractérisant la Paix, l'autre l'Abondance, et l'autre la Gloire tenant un buste oval, figure d'Henri IV; le portique orné de pilastres cannelés et moulurés au contour du chapiteau à oves et dards, surmonté d'un vase à anses et paquets de laurier sur le ceintre (sic) du chapiteau, la pendule placée au centre du portique dans sa boite à ornements; le tout de bronze doré au mat, ainsi que la lentille, figure de soleil, de 26 pouces de haut sur 15 pouces de face, par Lépine. Henri IV was the most beloved king of France, and there was a serious desire to associate Louis XVI, whose popularity waned as his reign progressed, with le bon roi Henri. Henri IV, desiring prosperity for the common people, coined the term “a chicken in every pot”. He was a great military leader and unifier, a famous gallant and patron of the arts, and he restored order and prosperity to a ruined and anarchic kingdom. E.g. Weber, Caroline. Queen of Fashion: What Marie-Antoinette Wore to the Revolution. New York: Henry Holt and Company, 2006. Pages 133, 163, 165 and elsewhere. Theodore Dell: Furniture in the Frick Collection Part 2; New York, 1992. Pages 51-61. Illustrated page 59.